When the Hyundai Genesis joined the CarAdvice long-term test fleet we had many of the same questions as you. Is it properly luxurious? How’s the real world fuel consumption with that thirsty V6? Will people stump up $70K for a Hyundai? Having spent several thousand kilometres behind the wheel of the mid-spec Genesis Sensory, the answers are becoming clearer. Since the Genesis is billed as a luxury executive car, let’s start there. 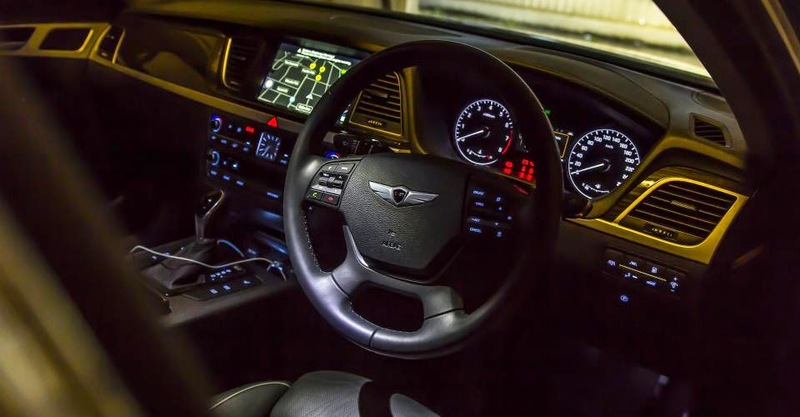 All Hyundai Genesis variants are well equipped with leather seats, satellite navigation, adaptive cruise control, and the full safety suite including autonomous emergency braking (AEB). It’s the additions to the Sensory model, however, that make the Genesis feel like a proper luxury car. The jump from base to Sensory will set you back $11,000, but most (if not all) will be leasing rather than purchasing outright. To put it into perspective, the difference between a base Genesis versus a Sensory will be around $300 per month. In real terms, it’s a couple of coffees a day. 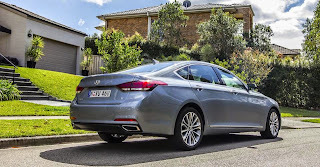 The seats in the base model feel like they use similar leather to far more affordable cars in the Hyundai line-up: hardwearing but not particularly plush. The Genesis Sensory steps this up to “Premium Leather” with an extendable seat base that offers supreme comfort for even the longest of journeys. Rear seat passengers are afforded the extra comfort too, with many complementing both the space on offer and the audio controls in the flip-down armrest. Have no fear parents, they can be disabled if necessary! The Genesis suspension is setup for smooth riding, and in daily commuting it does a brilliant job of soaking up the worst of Sydney’s battered roads. It can take an extra bob to settle when driving over larger speed humps, but not to the point of making occupants feel ill.
Road noise is well supressed, with minimal wind and traffic intrusion into the cabin. It’s worth mentioning the ride is noticeably better than on the top spec Genesis Ultimate, which moves from 18- to 19-inch alloy wheels. The added sidewall of the smaller wheels smooth out sharp edged bumps nicely. Helping to avoid damage to the rims and bumpers is the surround view camera system. It stitches together images from cameras on all sides to create a 360 degree view, aiding parking and navigating tight multi-story car parks a breeze. The head up display is particularly useful too, projecting the speed and blind spot monitoring indicators into your field of vision. With an increasing number of unmarked speed cameras and distracted drivers, it’s a very useful feature. Strangely, it isn’t able to display navigation prompts on the display like it does overseas. Apparently the local navigation software isn’t compatible, pity. The navigation system is very snappy, offering fast input of destinations and quick routing. The high-resolution maps make it particularly easy to follow even complicated lane manoeuvres. We did have the system wig out on us soon after we took delivery, which restarts wouldn’t sort. After a quick trip to Hyundai they were able to reboot the system, we’ll let you know in our final long-term article whether the issue returns. Perhaps my favourite feature of the Genesis is the Lexicon audio system. Made up of 17 speakers, the sound quality in the Genesis is simply superb, with clear highs and lows even at ear-splitting levels of volume. Bluetooth streaming has been solid, with fast reconnection and no drop outs in the time we’ve had it. Bluetooth music streaming quality is excellent too, with convenience winning out over the negligible improvement in quality over USB. The 3.8-litre V6 is a good performer, with plenty of low-down torque to make progress feel effortless. The 8-speed automatic is very smooth shifting, and takes care of quick three-point turns without fuss. The downside is definitely fuel consumption. The V6 petrol is the only engine on offer in the Genesis, resulting in a steady fuel consumption figure in the high 13s when tackling my hour-long 16km commute. Head to a motorway and the cruising economy drops to 10L/100km, which still isn’t great. It doesn’t make use of any of the latest fuel saving technology like cylinder deactivation or start/stop either. The 77-litre fuel tank makes for a range between 560km and 770km in my time with the Genesis so far. That just leaves the $71,000 question: will people spend this sort of money on a Hyundai? What has been interesting is the amount of attention the Genesis has received from passers-by who don’t even know it’s a Hyundai. It’s been mistaken more than once for an Aston Martin or Bentley, and learning it’s a Hyundai has invoked surprise rather than shock. 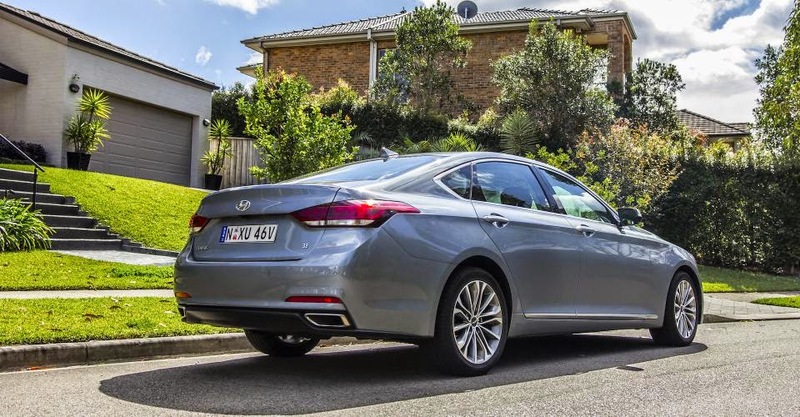 Most people who have seen it or sat in it have remarked how far Hyundai has come compared to their view of the brand, though most noted they’d struggle to stump up the cash for the badge. Interestingly, Hyundai will remove the Hyundai badge from the boot lid and replace it with the Genesis wings for a small fee. I wonder how many they’d sell then.